In a large mixing bowl, stir together cookie crumbs and 2 tablespoons melted butter until well combined; press into a 9-inch pie plate. Bake for 10 minutes; remove from oven and cool. In a large saucepan, over medium heat, combine milk, 1/4 cup granulated sugar, cornstarch, cocoa powder and salt; bring to a simmer, whisking frequently. Whisk the eggs together in a medium bowl, and gradually whisk in half of the hot milk mixture until combined; whisk the egg mixture back into saucepan containing remaining milk. Heat mixture, whisking frequently, until it starts to thicken up and coat the back of a spoon. To make the whipped cream, combine heavy cream and additional 2 tablespoons sugar in a medium sized mixing bowl, using a mixer on high speed, and beat until stiff peaks form - about 1-2 minutes. Spread whipped cream evenly on pie and sprinkle with chocolate shavings if desired. 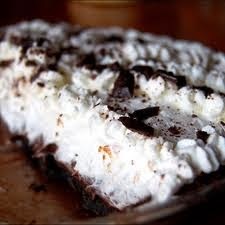 41 comments on "Chocolate Cream Pie with a Thin Mint Crust"
Wow, what a great pie! I love girl scout cookies and now have a recipe for the thin mintcookies. I AM a fan of mint...love it!!! Clouds of cream and then the subtle hint of mint..mmmm, I'm dreaming!! A Girl Scout cookie pie... GENIUS!!! So yum. I'm waiting for my cookie order now so I'll be making this pie for sure. Love mint, chocolate, and all that whipped cream of course. I sort of like the idea of all of that whipped cream. Chocolate cream pie always rocks. When well made, it's always a satisfying chocolate treat. While I think a thin mint crust is a cool idea, I'm not big on GS cookies. Too expensive. Bad quality for the price. Very little of the money goes back to the tropp (it mostly goes for administrative costs). I suppose I'm a little bitter abotu my days as girl scout and being forced to sell the things. It wasn't fun and although ti was supposed to pay for my fun activities, it seemed to only cover a very small portion. I would definitely put all of my Thin Mints into a pie crust without a second thought. I don't really eat many store-bought cookies myself, but I used to love love love thin mints as a kiddo; I'd eat them frozen, crazy I know...so naturally I'd love this. I was a Girl Scout and was always suprised how much people LOVE Thin Mints. My favorite are the Samoas. Hands down...the best packaged cookie EVER. yum! that sounds really, really good! i looooove thin mints. i don't think i've ever tried any other flavor of girlscout cookies... i always just spend all my money on thin mints. mmmm. i love oreos, too. and nutter butters. not much of a nilla wafer person, though. This looks baaad, Emily! The problem with me and cream pies is that I can't stop after one piece. Love mint and chocolate together. I could part with some to make this, it looks awesome! I love chocolate and mint, but it's really the only way I like mint. I'm totally with you: mint is an awesome flavor! Chocolate and mint even better! I can't wait to try this recipe (and I agree: thin mints don't count as store bought cookies). Little side story for you: chocolate cream pie was one of my favorite desserts, even before I could speak (we're talking about 1 year old range). So, my parents took me to this restaurant in the mall, and we left before my one-year-old self could get some of the restaurant's famous chocolate cream pie. I screamed so loudly on the walk back to the car that the mall security guards stopped my parents because the guards thought my parents might be kidnapping me. So, believe me when I say that I am beyond excited to try this recipe of yours! When I was growing up, mint took over our entire garden (as mint will tend to do), so we learned to love it in just about everything. Andes, thin mints, and mint chip ice cream....3 things that have been known to cause me to overeat. Especially thin mints....I think I could devour this pie in minutes. Emily, this looks beautiful. I will have to try for my husband. His 2 favorite flavors are here. Now if I could incorporate Heath bits in some way, he'd probably think he'd gone to heaven. I am obviously not a serious mint lover but do like mint with chocolate now and again. Your pie however looks divine! Might make a mint lover out of me. oh, this is an awesome idea. My mother always took pride in introducing us kids to lots of different cuisines, but she would never touch anything mint. She had (and still has) such an aversion to mint that she would never buy mint toothpastes and pick off the smallest sprigs of garnished mint on desserts. how creative! i'd make it, but i don't think my family is a big fan of mint..
You mean I have something else to blame my parents for? I hate mint (except in tea) and particularly with chocolate, But this pie looks divine AND thin mints in the crust are certainly optional, right? I can't resist chocolate and mint. I certainly couldn't resist this pie. Great job! What a great way to use the Thin Mints. My momma always put one box of Thin Mints in the freezer. On our annual trip to the beach, she unpacks them when everyone is feeling antsy in the car. It is the most heavenly cookie at that moment. Mommas are good for that. The thin mint crust sounds delicious! i'm certainly a mint lover, but the thin mints never really did it for me. i think incorporating them into a pie crust under some fluffy filling is a marvelous idea--kudos to you! I love mint too. I love my zone chocolate mint bars. Thin mints are definitely my favorite girl scout cookie! This looks delicious and a definite must try. I didn't get any girl scout cookies this year :( :( And it's too bad because I've been craving some thin mints! I'm also on the mint lover's group! Specially if it's paired with chocolate! Love the idea of "minting" the crust! I have cookies ordered, and now I can't wait for them to come!! I'm having brioche bread pudding for breakfast, and it's so good, but, BUT is it wrong to want dessert after my morning dessert? Have you ever had After Eights? My mum used to hoard her stash, but I always managed to sniff them out. Ah, the good old days. girl scout cookies are the best! They make everything better.